I’ll get the travel bragging out of the way first: I got invited as a guest to a wine show near Florence, Italy, to taste wines and have discussions with around 40 winemakers and/or winery reps.
That’s one of the perks of importing wine. Producers want to export to the U.S., and they know they can’t hope to simply be discovered by an itinerant importer who stumbles on their winery one day. And as I’ve mentioned before, there are way too many producers out there for importers to rely on just getting lucky and finding the perfect match blindly. It occurred to me after this trip that the industry devoted to bringing buyers and sellers together is basically running a dating service with two different approaches. The first is a group show, where producers have tables in a big hall and buyers can wander, taste, and talk. The second is an appointment-driven show, where you and the producers check out each other’s profiles and agree beforehand that you’re going to meet, then you schedule the time. These different styles borrow from one another as well, and you’ll often find that the appointment conferences have an exhibit hall component, and vice-versa. But you can count on attending something that’s predominantly one form or the other. It’s easy to link the two meeting styles to their dating counterparts. The first is like going to a big singles mixer and trying to chat up some people (who are there for the same purpose you are, eliminating much of the uncertainty). 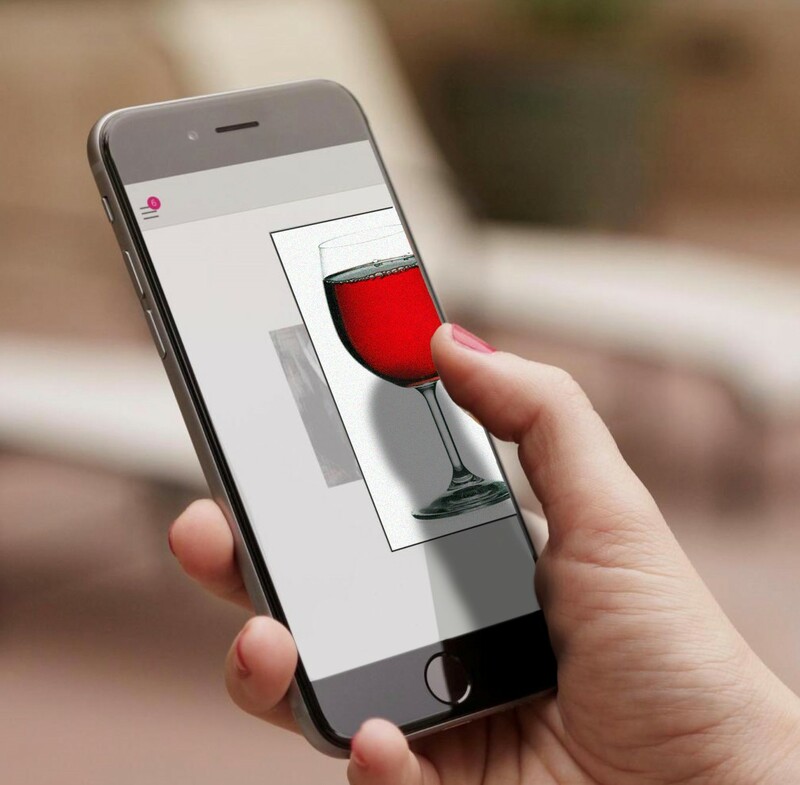 The other is more like scrutinizing potential matches on a dating app before swiping right or left, and then mutual right-swipers agreeing to meet (for a glass of wine in a public place, naturally). Generally, the big events take place in less immediately-attractive surroundings, because few places that fit thousands of people are also going to be pretty or interesting. Think of a generic hotel ballroom or a cavernous convention center. Often there’s the feeling that you could be anywhere, despite the foreign language. That doesn’t mean there can’t be meaningful contact if things look promising, but you have to overcome the noisy, uninspiring atmosphere. Plus there are other potential suitors lurking nearby, waiting for you to finish your conversation. This is the Medici villa near Artimino in Tuscany. I attended a wine show there that linked wine producers and importers. The surroundings were so lovely it was difficult to think anything but good thoughts. No doubt what the organizers had in mind. The smaller shows can individualize and enhance the ambiance of the potential matches between producers and buyers. 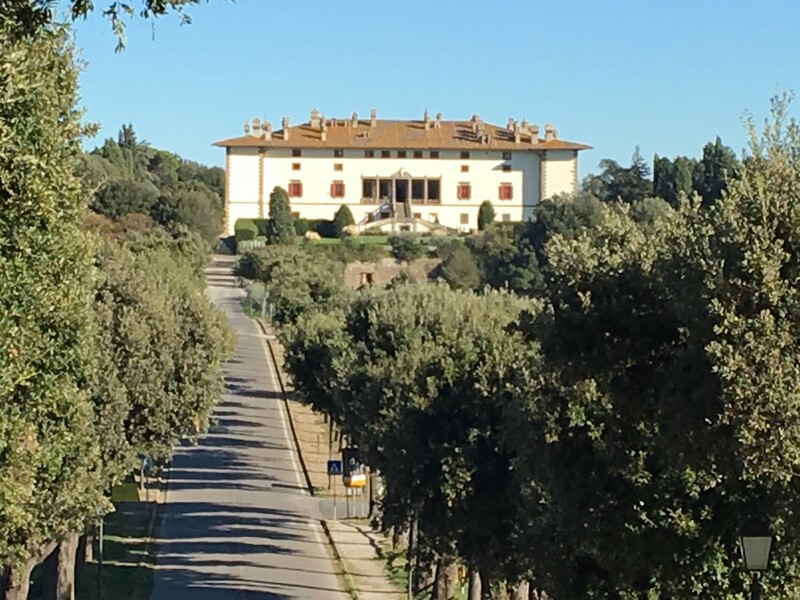 The most recent show, in Artimino near Florence, was in a hilltop villa constructed by the Medici family, and Cy and I were housed in an apartment that was a 10-minute walk away on the next hilltop. The walk to the villa afforded us a 360-degree view of Etruscan ruins, beautiful vistas and scenery, and we could even see the Duomo in Florence from just the right spot. I’m not easily impressed, but this was lovely. The organizers were clearly hoping that the surroundings would put us all in the mood for love. I admit I was inclined to look on the entire enterprise favorably from the start just because of where we were. Maybe I’ve belabored the point here, but it also occurred to me that this same dating analogy doesn’t hold true for most other work-related conference expos. Or even art or craft shows. When wine buyers (presumably wine lovers) meet winemakers, there’s already a bigger spark than you’d otherwise find. And at our meetings I can tell from their products whether they’ve adhered to the traditions of their region or departed from them, even before I hear the story of their family-owned wineries. Subsequent conversation reveals the reasons behind their decisions – and when philosophies align, it can lead to the beginnings of a solid personal connection that goes beyond business. Maybe that’s also true at fancy food shows, but I suspect it doesn’t happen when you’re seeking to buy most commodities. Then, at the bottom of Page 2, there’s a calendar of preparation activities that starts 18 days out. 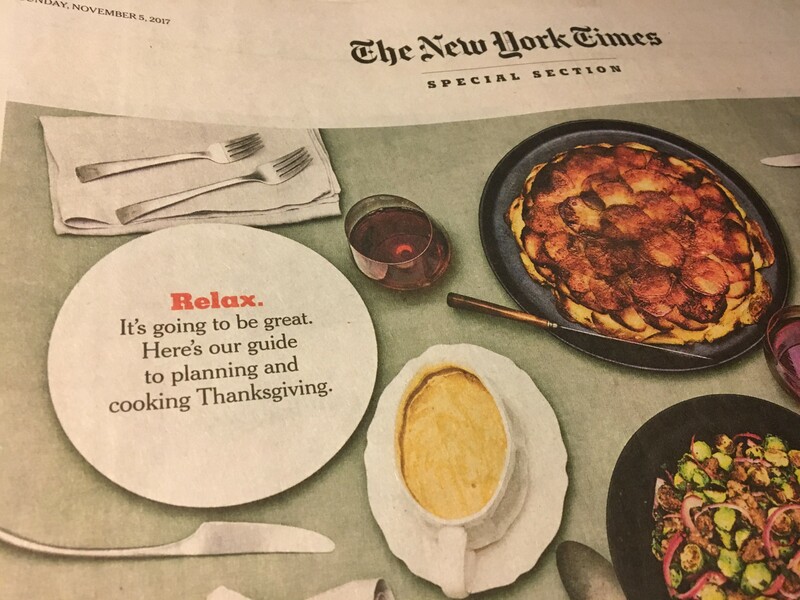 In other words, once you put down the Sunday paper, there’s a list of things for you to do to prepare for Thanksgiving. Ummm, that’s supposed to be relaxing? Maybe if you’re ultra Type-A and have to have something to do at all times. I’m swiping left on that, thanks. Cy and I are doing something that’s actually relaxing. We’re going to Dare and Mark’s for Thanksgiving instead of cooking it ourselves. Of course we’re going to bring something for the festivities. As I’ve mentioned in the past, Cy’s family always has a pre-dinner appetizer spread. I didn’t understand it the first time I spent the holiday with them, since there were a ton of appetizers and then 30 tons of food. But I quickly came to see the value in food that gets people out of the kitchen when you’re trying to get things done. I’ll be bringing goat cheese tart, which is one of the most-viewed recipes on this blog. I’ve updated it a little, giving it a sweet and savory topping that uses some of the hot cherry peppers I pickled this summer. Plus chopped dates and olives. I make granola so I have a lot of dried fruit at home including dates, but you can use raisins, chopped dried apricots, or prunes instead. For wine, I’d go with a light red since the tart’s an appetizer and there’s plenty more drinking to come (at least for me, anyway). Château de Clapier Calligrappe ($12) is 75% Grenache, 25% Syrah. Lighter in body, but still rich in flavor. Great with the goat cheese and the toppings, and no one will feel too full. Enjoy the run up to Thanksgiving, everyone, no matter how you’re spending it! This entry was posted in Thanksgiving, Uncategorized, Wine shows and tagged Chateau de Clapier Calligrappe, Dating, Dating apps, Goat Cheese Tart, Singles Mixers, Swiping left, Swiping right, Thanksgiving recipe, Tom Natan, Wine buyers and sellers, wine delivery washington dc, Wine shows. Bookmark the permalink.